As you play and interact with your baby during his first months of life, you may notice that he already has a wide range of movements from the first days. Things like sucking on a finger that touches his lips or turning his head toward the direction of a touch on the cheek. Those may seem like planned actions, but they are automatic responses called primitive reflexes. These reflexes are present in utero and at birth and they can be triggered by changes in the baby’s environment or body. Primitive reflexes exist to help a newborn move, develop, and survive, but they should integrate or disappear within the first year of life. In most cases this happens, but when they don’t, they may have negative implications in areas as broad as physical coordination, bedwetting, muscle tone and learning abilities. The more that infants interact with their environment and participate in daily activities, the more likely that those reflexes will be incorporated or integrated into their basic repertoire of movements. The good news is that the vast majority of babies will have no issues incorporating these movements – and parents can help them by engaging in focused play. Babies have 70 known primitive reflexes present in utero and at birth, but we are going to concentrate on five that are among the ones with the biggest impact on early development: The Moro Reflex, Tonic Labyrinthine Reflex, Galant Spinal Reflex, Asymmetrical Tonic Neck Reflex, and Symmetric Tonic Neck Reflex. What is it? The Moro Reflex is also known as the startle response because it is triggered by a sudden noise, bright light, or an unexpected change in body position. You have probably seen your baby startle and spread their arms and open their hands, suggesting that they feel that they are falling. They will then bring their arms back to their body with the elbows bent. 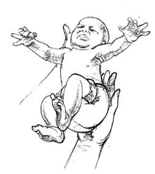 This is the Moro Reflex. It is the primitive form of an adult’s Fight or Flight response and is your baby’s innate attempt at self-protection. Why do I care? Integration of the Moro reflex is essential to develop balance, coordination, and impulse control. A retained Moro reflex could result in over sensitivity to noises and lights, anxiety, and social immaturity. When should it disappear? 4-6 months of age. What is it? TLR is triggered by your infant’s head movements and can be seen when your little one is on his belly or his back. When your baby lifts his head, his arms and legs will straighten and his toes will point. When he looks down his arms and legs will bend. Why do I care? This reflex is crucial to help babies strengthen their necks and core muscles. It helps prepare them for key milestones like rolling over, crawling, standing and walking. Retaining this reflex often results in children with issues in posture, muscle tone, balance and spatial awareness. When should it disappear? Around 6 months of age. What is it? The Spinal Galant Reflex can be elicited by running a finger down your baby’s back, parallel to the spine from the neck to the base of the back. Your baby will automatically move their hips toward the direction of the stimulus, in this case, toward your finger. Why do I care? This automatic movement assists to develop a range of motion in the hips of the baby that will help them with crawling and walking. Retaining it may result in issues like fidgeting and inability to sit still. Some studies also show links to bedwetting and attention problems. When should it disappear? 3-9 months of age. What is it? When your baby turns their head to the side, their arm and leg of the same side extend, creating a “fencing” position. The arm and leg on the other side flex or bend. Why do I care? ATNR is an important reflex for the development of hand-eye coordination. If retained, it may also create problems in the learning process of the child, specifically in areas like handwriting and reading. When Should it disappear? Around 3-6 months of age. What is it? When your baby looks up his arms straighten while his rear moves down and his legs bend. When your baby looks down, the opposite happens, his arms bend while his rear goes up and his legs extend. It’s easiest to see this reflex if your baby is on all fours. Why do I care? Retaining STNR may lead to issues with posture, left to right visual tracking and hand-eye coordination among others. When should it disappear? STNR is not present at birth. It appears when your baby is 4-6 months old and disappears by 12 months old. It is important that reflexes disappear or integrate within the first year of life so that more controlled and refined movements can develop. Tummy time (while your baby is awake) and frequent interaction in a multitude of positions are essential in promoting development, strengthening muscles, increasing coordination and integrating reflexes. Babies learn through play and experiencing the world around them, so time spent in a supported seat, car seat, or bouncer should be limited.